When Electronic Arts’ battle royale shooter Apex Legends surprise-launched early last month, it seemed like the entire gaming community started paying attention at once. Part of the reason for the immediate surge in interest was that EA paid top Twitch streamers to promote the game. And, in fact, one of those streamers, Fortnite extraordinaire Tyler “Ninja” Blevins, may have earned as much as $1 million for doing so, according to Reuters. Ninja’s live-streaming and social media promotions helped Apex Legends gain traction among his 13.6 million-plus Twitch followers, as well as his Twitter following of over 4 million and Instagram audience of over 13.2 million. Now, an anonymous source tells Reuters that his efforts were reportedly worth the seven-figure sum. Game companies paying streamers to promote a new game is not a new development. Since the rise of gaming-centric content on YouTube more than a decade ago, companies have increasingly turned to content creators to build buzz for a game, treating those influencers as critical tastemakers that can help a new title blow up overnight. Now, with Twitch owning the space around live-streaming and YouTube sharing (but still largely dominating) the video limelight with Instagram and Twitter, it seems like paying influencers to promote a game launch is the new normal. But we’ve never before heard exactly how much creators like Ninja earn from these deals, making that $1 million figure (if accurate) a head-turner. Whatever agreements EA had with paid content creators during the initial launch — a period that lasted only 24 hours, the company tells The Verge — streamers like Ninja, Michael “Shroud” Grzesiek, and Jack “CouRage” Dunlop, among many others, continued to play Apex days and weeks after it came out on February 4th. That led to a largely organic surge in its popularity, EA claims. 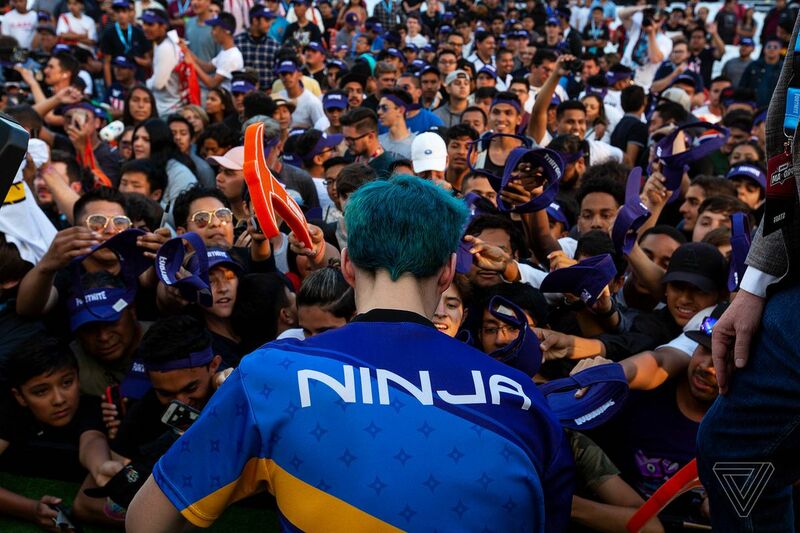 Still, Ninja disclosed in his streams and on social media until February 8th — a longer period than 24 hours — that he was being sponsored by EA. It isn’t clear if he was disclosing out of caution or whether he assumed the arrangement lasted longer. Regardless, after its first month on the market, Apex developer Respawn said the game had 50 million registered players across console and PC, no doubt helped along by Ninja and other streamers. It’s difficult to say how large the reported $1 million EA deal is in comparison to Ninja’s other deals or compared to deals other streamers have made, which have similarly been secret. But we do know that a month after launch, Apex Legends has grown remarkably fast — it now has a quarter of Fortnite’s 200 million registered users, and it’s continuing to grow. Ninja, on the other hand, has resumed streaming Fortnite for the most part since the launch of the game’s eighth season late last month.